In other words, keep your knee over your foot! Or better yet, keep your knee over your ankle joint! Does the position of the knee change if the person does not have Patellofemoral Joint issues? For instance in my Olympic squats, the knees are just at the edge of my toes. In “deadlifts” I place my shins against the bar on the floor and hinge back from the hips with a neutral spine, but in full squat the knees move forward. I have tight achilles too, so limited flexibility in DF…and long femurs sort of make the distance from the bar a bit odd, but I manage with good form. My focus would be: Does the Knee stay over the ankle or just at the edge of the toes? Would it depend on what exercise one is performing? 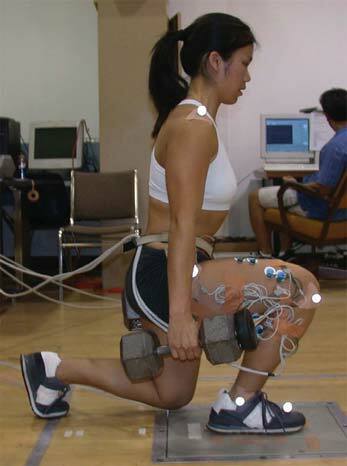 Squats or lunges ( stationary or stride ) Or is this specific to this pathology? I am gathering different views and they are all different! : ( hence the life of a student! thank you for your time and the BLOG! Basically, the farther the knee goes over the foot/toes, the greater patello-femoral pressure. The longer the stride the less the pressure. It’s not wrong to let the knee go a bit forward, it just increases the compression. If you have a healthy joint, no problem. If you have chondromalacia or worn cartilage, might be a problem. Same principle for stationary or striding lunges.